DBEdit is a database editing tool, written in Java, which is suitable as a front-end GUI for your Oracle, DB2 or MySQL database. CDBF is a powerful database viewer and editor that lets individuals and business users access databases directly without programming via the familiar Windows interface. This small and handy utility offers everything you need for working with dbf. 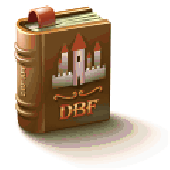 The CDBFinfo Shell extension allows you to view brief information about a DBF file without opening it. The CDBFinfo Shell extension supports dBase III, dBase IV, FoxPro, Visual FoxPro and dBase Level 7 formats. CDBFview is a plugin for Total Commander. It allows you to view DBF files in Lister's window (Also in Quick View Panel). You can: search some text in the DBF file. copy to the clipboard the selected record. hide or show deleted records. sort DBF file by clicking on a column header. set default order of records. switch Ansi/OEM charset (Autodetect Ansi/OEM is available, too). Database editor, suitable as front-end for all your relational databases.